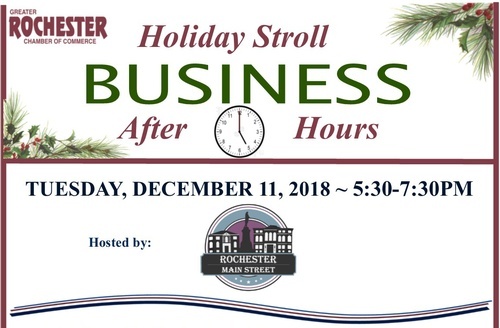 Join Rochester Main Street and participating downtown Chamber members to celebrate the holiday season! Chamber members and their guests will enjoy holiday cheer and light refreshments! Attendees will register at RiverStones Custom Framing (33 North Main Street) and receive a passport before visiting with other participating member establishments in the downtown area. All attendees will gather back at RiverStones for the conclusion of the event where the raffle drawings will also take place! A full list of participating businesses will be listed on your passport at RiverStones Custom Framing the day of the event.